Fit-Ink: Walk or Run Through the Rest Stops? I've always wanted to know what the consensus is about walking or running through water stops when you're racing. With marathon season nearly upon us, the water station question seemed like an appropriate one to ask. Do you walk or run through them? Does it depend on the race and the distance? Do you have a pattern that you follow? I've known people who swear by walking through the water stations at the marathon. They say they can't drink from the cups unless they've slowed down. They've been instructed to do so by a coach or pace leader and then reconvene with the group after stopping for fluids. They say they reached the point in the race where they can't run anymore and walking takes over and it's better to walk the stations and attempt to run after leaving the station to make it to the next station faster where another walking break is waiting. Then there are others who only run through the stations and run the whole race and sometimes don't even care who they take out in the process. You know these people: the ones who hit you from behind, spill liquid on your feet or steal the cup out of the volunteer's hand that you were going to reach for. Or they know that if they stop to walk there's no way they'll be able to resume running. As for me? I'm more the in between. At the beginning of a race, if it's a marathon, I'm always running through the stops. I try not to squash people in my wake but I've definitely had a few cups that I've eyed but watched go to another runner. Depending on how I feel, I'll either run through the stations later in the race or walk through. The walk through, at least for me, signifies I've kinda thrown in the towel on the race and I'm just waiting for the finish line--it's a no PR day. Not glamorous but I guess I'm lucky that I'm able to grab the cup, pinch it to form a crease and then funnel the liquid down? That's at least how I felt when an accomplished marathon friend said she never runs through the stops mostly because she gets more water on her than in her mouth. That could work on a hot day but then you could be leaving yourself dehydrated at the same time. The only time the running method doesn't work so well is when the stations are stocked with plastic cups and not paper ones. I'm still not sure why some of those stations at the California International Marathon used tiny plastic cups to quench the thirst of the runners--the plastic cups crunched on the ground almost posing a running hazard, I definitely spilled liquid down my front when the cup wouldn't give, and what I did get down left me wanting more but having to wait another two-plus miles to get it. 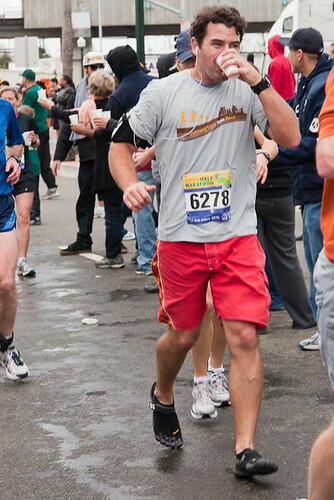 I loved the race, but that was the one frustrating part I remembered as I logged those 26.2 miles. I'm a runner through the water stations with an asterisk for not-so-good race days. What are you?